Batch 4 of Juice Train has just been released and so we thought it might be worthwhile goinIt’s been a long journey that will undoubtedly continue, but with the completion of the Deeds Brewing Co. Brewery in Glen Iris imminent, the Juice Train is finally coming home. Originally brewed at Ballarat Uni for GABS 2017, the Juice Train was intended to be a seasonal New England-style IPA, brewed 1-2 times per year. Heaps of wheat and rolled oats were laid upon a foundation of pale malt providing a heavy mouthfeel and the 6.5% ABV. Late additions of hops were added to the whirlpool allowing for intense aromatics to shine through and the moderate IBU of 25 to be attained. London Ale III yeast was pitched providing the fruity esters and a slightly sweet finish complementing the mash profile. The finishing touch was a three stage dry hop at various times during fermentation. The timing and combination of the hops used resulted in an extremely tropical and juicy beer that sips smoothly like silk, provides an intense flavour, but with mild a bitterness and no hint of alcohol. It’s no surprise that after its release and reception, that it’s destiny would be a spot among the core range of Deeds Brewing. Within six months, the batch size was stepped up from the initial 6hL batch to a 35hL batch. The product was enjoyed and Batch 002 was brewed to the tune of 80hL. Some slight changes were made to the recipe, bringing the IBU down a touch and the oats were increased ever so slightly. It was Batch 003 however where the Juice Train almost derailed. The life span on a New England style IPA is not long. In Vermont where the style originated, the common instruction is to “treat this beer like milk. Keep cold and drink fresh.” The reason is that the highly hopped and hazy nature of the product lends to deteriorating quickly. A slight issue with processing post fermentation, a touch too much oxygen pick up, and your beautiful golden haze turns a mucky brown. Not uncommon, many breweries producing hazy beers have faced the same issue and have had to work through it. A little TLC, some process changes, and an reinvigorated focus on each step of the production kept this train off the scrap heap. Batches 004 and 005 were back to form and came out strong and most importantly delicious. Craft brewing is fundamentally about experimentation and the constant development of new and innovative flavors. They don’t always hit the mark. If in fact, if you don’t have a few misses up your sleeve you are doing it wrong! The Juice Train’s ride isn’t over yet. One of the first beers to go into tank at Glen Iris will be the Train. Subtle changes here and there will continue to refine it. The pursuit of perfection is a never ending journey. Luckily, the Juice Train won’t be travelling alone. 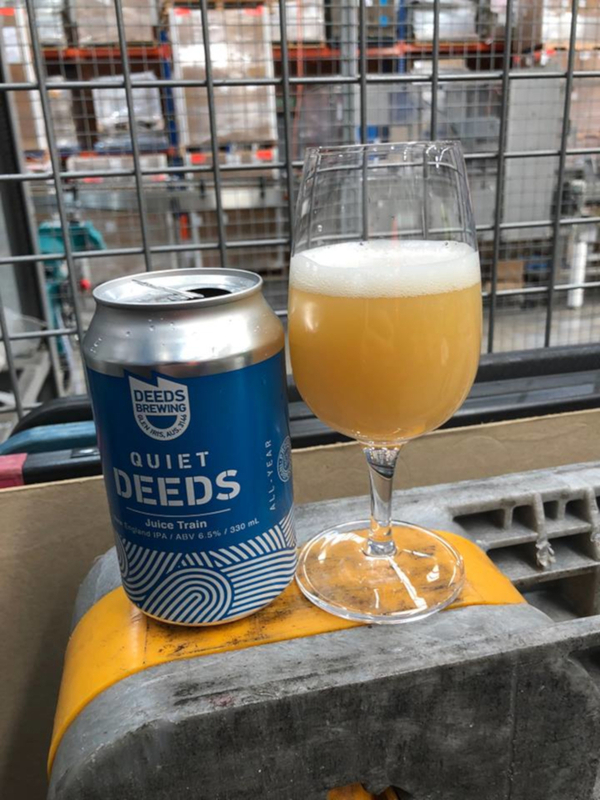 The Deeds IPA, the Blurred Vines DIPA, and a whole host of collaboration beers IPA’s are on the horizon. Flavor is Coming.